The Italio-Brazilian architect Lina Bo Bardi (1914–1992) forged a unique path with her bold designs. Spanning architecture, stage sets, fashion, and furniture, her work drew inspiration from the International Style, which she translated into her own visual language. Fundamental to her aesthetic was an ever-present and thoughtful engagement with her adopted country of Brazil: its culture, society, and politics, from which she productively and provocatively voiced her at-times radical views through numerous exhibitions and writings. 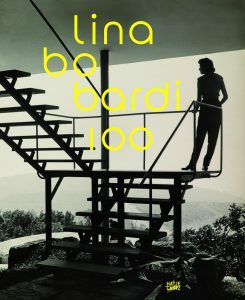 This book is published on the occasion of the exhibition Lina Bo Bardi 100 at the Architekturmuseum TU München at the Pinakothek der Moderne, and recognizes Bo Bardi’s entire built oeuvre, including her own home (the so-called Casa de Vidro), the Museo de Arte de São Paulo, and the cultural center SESC Pompeia, which are today among the most renowned buildings in the city of São Paulo. This publication is available in German und English.